The Health and Safety (First-Aid) Regulations 1981 require employers to provide adequate and appropriate equipment, facilities and personnel to ensure their employees receive immediate attention if they are injured or taken ill at work. 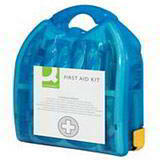 These first aid kits provide the kind of essential materials any business is likely to need to meet these requirements. You’ll also find an eye wash station here, as well as a first aid kit designed for any vehicle.